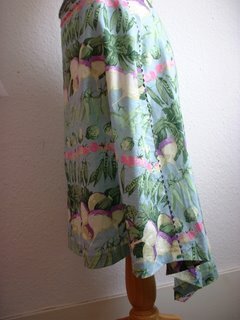 The turnip skirt, as promised! The back hem is about 8 inches longer than the front, which is turning into a bit of a trademark. I love it, such a great way to make a simple 3 panel skirt a whole lot more interesting. 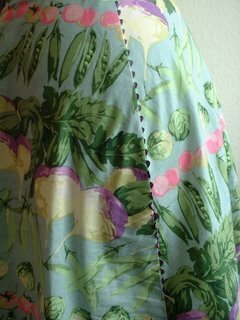 I also tried putting in ric rac in the side seams. It really is fiddly, and I was not 100% happy with it. But it makes me happy to know it’s there. There is going to be a little less blogging in the next week or so, or at least less pictures as I broke my camera today. Knocked it off the table while I was doing these shots. Bit traumatised and not sure what I am going to do. But at least I took a few first, so I will spread them out over several posts and hopefully will resolve the problem (by buying a new camera). Ho hum. Also I am off early in the morning to spend my wet weekend in Basingstoke. As I have lots of non-uk readers I should explain that Basingstoke is not an exciting place. Very much not. It is not a normal tourist destination… but I have found a nice campsite out in the countryside in which to enjoy my night of lashing rain and gale force winds. A very English holiday. Brilliant skirt! Have fun in not so fun Basingstoke! I love this skirt, especially the hem at the back. Basingstoke – well it mostly feels like home to me – I came to work over 30 years ago and just got attached. Its ok, I’m not offended, it has been very wet – but that has made the beautiful Hampshire countryside v. lush. Yes, the countryside round there certainly is lovely, but of Basingstoke I have really only seen Popley and the ring road, so perhaps I am a little unfair!